Memitr Thai Fisherman Pants are made from good quality cotton well made. It's unisex pants that are made very wide in the waist, one size fit for L-XXL . • The additional material is wrapped around the waist and tied to form a belt. They are usually made of cotton or rayon. Although traditionally used by fishermen in Southeast Asia, they have become popular among others for casual, beach and ideal for Yoga Practice, Maternity wear, street wear, festival wear, uniform, dance and leisure as well as for backpackers. • Total waist 56 inches Fit for waist 28-48 inches, Free Hip, Total length 42 inches , Inseam 28 inches (Low), Around Leg 28 inches, one pocket on the right hand side. 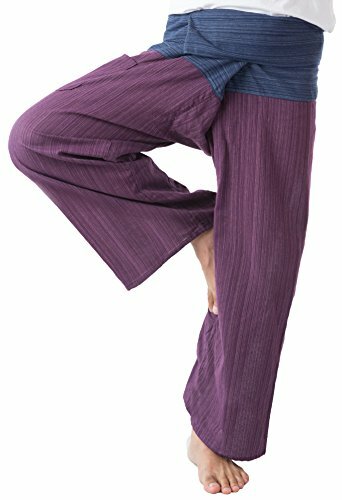 • Thai Fisherman Pants have a very wide waist with a belt that ties from the rear. Simply step into the pants, pull the waist out to one side wrap the extra fabric around to the front and tie the belt. Length can be adjusted by folding over the top of the pants! • Our high quality fisherman pants are handmade Made from 100% strong and durable heavy weight cotton drill. Well made. • Thai Fisherman Pants have a very wide waist with a belt that ties from the rear. Simply step into the pants, pull the waist out to one side wrap the extra fabric around to the front and tie the belt. Length can be adjusted by folding over the top of the pants! If you have any questions about this product by MEMITR, contact us by completing and submitting the form below. If you are looking for a specif part number, please include it with your message.